For example, who would argue that God wasn’t drawn to Noah and his family, favoring them more than all others during his time (Genesis 6:17-18)? Or what about Abraham? Didn’t he and God have a special friendship (James 2:23) that was not shared with others? Consider Joseph, is there any doubt that God was specifically working in his life (Genesis 39:2)? And, who would deny that God had special plans for an obscure shepherd boy named David (1 Samuel 16:12-13). Or that He didn’t favor Mary over all the young Jewish girls in Judea (Luke 1:26-28)? [i] So we see God has favored certain people above others. So what does it take to be one of God’s special people, to be favored by Him? To answer that question let’s look at another of God’s favored people, Caleb and learn from Him the traits that God looks for in a person with whom He will favor. Do you want God’s favor then be a servant leader. From Ephesians 5:23 we learn that the “Husband is head of the wife even as Christ is the head of the church.” Husbands, do you want to be favored by God? Then be like Jesus and be a servant leader of your wife and family (Ephesians 5:25-27). Fathers, do you want to be favored by God? Then be a servant leader for your children humbly teaching them God’s word both verbally and by your actions (Ephesians 6:4). Elders, deacons, and preachers, do you want to be favored by God? Then be servant leaders to those the Spirit has entrusted you with, not lording over them but humbling yourself and serving as if you were their slave (Matthew 20:25-28). Ladies, do you want to be favored by God? Then be a servant leader in to your family (Proverbs 31:10-31; 1 Timothy 5:14). I think I have expressed this before, but women are to be the heads of the house (“keepers of home” (NKJV) “work at home” (ESV) literally means rule the house[ii]), or in the context of our lesson, servant leaders of the house. She is not to lord over her husband or children but serves them while she leads the house. (Men are head of the family, Ephesians 5:25-27; 6:4, while women are heads of the house affairs.) What do we seen? A servant leader is the kind of leader that is favored by God. What’s the key to be a servant leader that is favored by God? Paul said humbly put others and their interest before yours, serving them like Christ has served us. How much better would our homes be if husbands and fathers, wives and mothers had this spirit of leadership? How much better would our congregations be if elders, deacons and preachers possessed this spirit of as the heart of their leadership? How much better off would our children be if we as parents lead them in this fashion? The answer is, it all would be so much better because it would receive God’s favor. 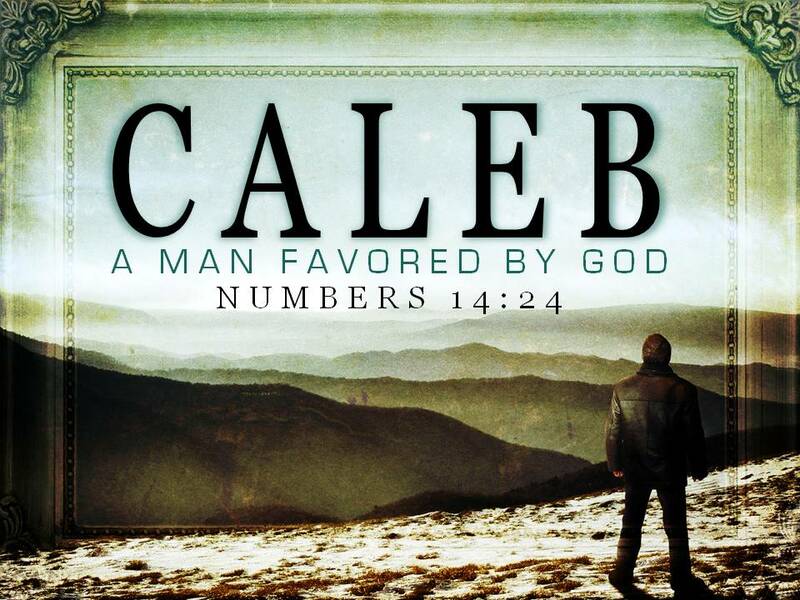 We see that Caleb was favored by God because he humbly served others as God’s servant leader. It was with this statement that Caleb exhibited his God favoring trait of being different. What is it about this statement that’s so special? Let’s compare him to the 10 spies who gave the bad report. They were all chief’s from their tribes. They had all gone on the mission together and all it entailed. And they both started their speeches talking about how great the land was (compare Numbers 13:27 to 14:7b). What separated him from the rest? What was it that made Caleb different? It was that he brought God into the conversation of taking the Land. Aside from Joshua, Caleb is the only person in this whole scene who is talking about God. Because God was in Caleb’s heart, God was on Caleb’s lips. This is what made him different from the rest. There’s no doubt we as Christian are to be different people. Our outlook on life is to be different from the rest of the world. Because our outlook is different, our priorities are to be different. Since our priorities are different then our activities are to be different. These differences lead to our moral and ethical standards being different from the world as well. This is nothing new. If you’ve been in a church for any length of time you have heard countless sermons on these subjects, especially about how we’re to be different by refraining from the doing the things the world does. But may I submit to you that if we are to be favored by God then we need to be different, not by merely refraining from certain behaviors, but also by engaging in God-favoring behaviors. That’s why Caleb was different. He was different because he was engaging in a God-favoring behavior that was different from those around him. And if we’re going to be people who are favored by God then we need to be different like Caleb by doing something different, and that is bring God into the conversation of our lives. I was talking to a good friend of mine the other day. He was lamenting a remark made by one of his students in Bible class. My friend said, “One of my students told me that his parents don’t talk about God at home. They are just too busy.” That’s sad. That’s sad that God is not spoken of in this supposed Christian home. Will God favor this home? He won’t unless they begin to be different and bring God into the conversation of their home. The second area we need to bring God into is the conversation of our plans. That’s what James is teaching in James 4:15 where he said, “Say, ‘If the Lord wills, we will live and do this or that.’” Bring God into the conversation of our plans. Recognizing that “in Him we live and move and have our being” (Acts 18:28). Do you want to be favored by God? Recognize that you live for His will, and at His good pleasure He allows you to do this or that. But just don’t think it in your heart, express it with your lips to God, to yourself and to others. Let everyone know that you’re different, that you freely submit to the will of the God for your life. Finally, we need to bring God into the conversation of our thanksgiving. We recognize that God’s will for us is to be people who “give thanks in all circumstances” (1 Thessalonians 5:18) and “[give] thanks always and for everything to God the Father” (Ephesians 5:20). We do a good job with that when it comes to thanking God in private but what about in front of others? Caleb wasn’t different because he kept God in his heart. He was different because God was on his lips. We need to bring God into the conversation of our lives by giving thanks in front of others. Let me give you two passages to consider. The first is Psalm 35:18, “I will thank You in the great congregation; in the mighty throng I will praise you.” Here David says I will thank You in the assembly of Your people. Friends it is so very important that we thank God in the assembly, it will go a long way in stirring up love and good works (cf. Hebrews 10:24-25). The second is Psalm 18:49 (NKJV), “I will give thanks to You, O LORD, among the Gentiles.” Again David is giving God thanks but not in front of believers, but in front of Gentiles, those who were outside the fellowship of God. If we would do the same, if we would give thanks to God, bring Him into the conversation of our lives and do it in front of non-Christians, then it would go a long way in prompting them to ask “for a reason for the hope that is in” us (1 Peter 3:15). It takes courage to be different from a world that worships conformity. But if we are to be people who are favored by God, we’re going to have to be different by bringing God into the conversation of our lives. And if we have the courage to do that, His favor will be upon us. So far we have considered two God-favoring qualities that Caleb possessed, first, he was a servant, and second, he was different. The third God-faoving quality that Caleb possessed was that he remained loyal. You’ll recall from our original text, Numbers 14:24 that God said of Caleb, “He… had followed Me fully.” That’s another way of saying, “He has remained loyal.” For Caleb being loyal to God, following Him fully would have been easy in the camp of the Israelites. It would have been easy to be loyal when he spied out Canaan with his “band of brothers.” But God didn’t favor Caleb because he was loyal, or because he followed Him. He favored Caleb because he remained loyal, because he fully followed God. He remained loyal despite the fortified cities, in the face of the giants, even with the strong nations they would have to fight and he remained loyal even when his fellow Israelites were ready to stone him (Numbers 14:10). God favored Caleb because Caleb stood out from the rest, while their loyalty was failing, his loyalty to God remained intact. The real challenge of this lesson is to remain loyal. For the vast majority of the time, being loyal to God is no problem. We all know too well that the moment we think life’s going good, then Murphy moves in and everything crumbles. All of us from time to time will face our proverbial strong cities, our towering giants, and our mobs rock wielding brethren. For you it might be financial woes that you’re fighting against. Do you want to be favored by God in that struggle? Then don’t waver, remain loyal. It might be sickness and the consequences of old age that you’re facing. Don’t give in embrace God’s favor by remaining loyal. It might be the temptations of Satan that you’re fighting against. Don’t budge, instead resist him, remaining loyal to God and He will give you His favor to overcome. You can do it friends you can remain loyal. Will be hard at times? Sure but just like Caleb you can do it. Finally, in Joshua 14:6-15 we have the last scene of Caleb’s life. By this time he’s eighty-five years old. And what is he doing? He’s getting ready to take the land that God promised him when they came back from their spy mission (Numbers 14:24). What do we see here? We see a man who in the twilight of his life of who has remained loyal to God. The text goes on to say that he conquer Hebron in Judah and from there he conquered Debir (Joshua 15:13-19). Why was he able to accomplish this feat at such an age? Because God favored him. Why did God favor Caleb? Because he was a servant, he was different and because he remained loyal. And therein lies the true incentive for possessing these God-favoring qualities; if we will be servants, be different and remain loyal then God will give us our promised land in His time, just like He did for Caleb. I have no doubt that you want to do great things for the Lord as well; that you want to receive His favor just as He has bestowed on others throughout the scriptures. I’m here to tell today that you can. You can be favored by God when you’ll be like Caleb and possess the God-favoring qualities that we have discussed. Will it be hard? Sure, but I know you’re up for the challenge because God wouldn’t call you to it accept it if He first hadn’t empowered you to accomplish it. Thank you for taking this journey with me into the life of Caleb. I hope that you’ll give consideration to the lessons we have discussed that you too will work to possess the God-favoring qualities that Caleb had. [i] Atteberry, Mark. The Caleb Quest: What You Can Learn From The Boldest Dreamer In The Bible. Nashville, TN: Thomas Nelson, Inc. 1996. Print Page 36-37. [ii] Thayer – G3616 (1)to be master (or head) of a house. (2) to rule a household, manage family affairs. What an inspirational look at Caleb! Papa put Caleb on my heart a week ago to learn about him & to be encouraged by his life. This article brought much revelation & encouragement. Thank you for being Holy Spirit led in your writing. Many blessings to you!